Beside growing new plants from seeds, one of the greatest gardening joys now – while outside is still plenty of snow – is propagating dahlias from basal cuttings. I have done this last year on a near-industrial scale, this year I am only propagating two varieties that I did not propagate that successfully last year. 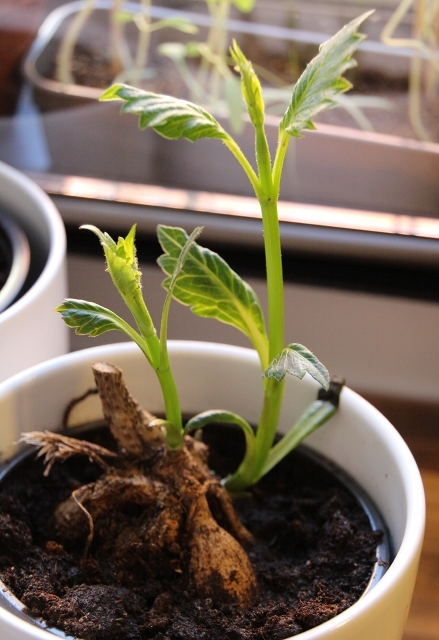 After waking up the dahlia tubers, the key is to wait for the right moment to take cuttings from the new shoots. Literature states that shoots should be 10-12 cm long, which I found a somewhat vague description. Dahlia shoots push a pair of leaves above the stem, should the leaves count as part of the length? Depending on the variety and the vigour of the shoot the leaves contribute to the length up to 4 cm. My observation from taking cuttings from seven different varieties last year is that the length isn’t so important as the vigour of the shoot. I have taken substantially longer and shorter cuttings that rooted all well and had perfect-length cuttings rotting or wilting away rather than rooting. The perfect cutting is rather thick, 5-6 mm at the base, vigorous (main shoots, developing quickly) and has small strong leaves. 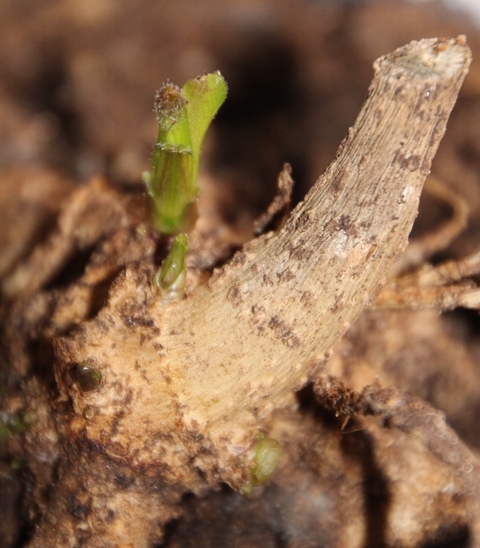 The thinner secondary shoots and shoots of poorly watered or partly rotten tubers tend to be weaker and are less successful. 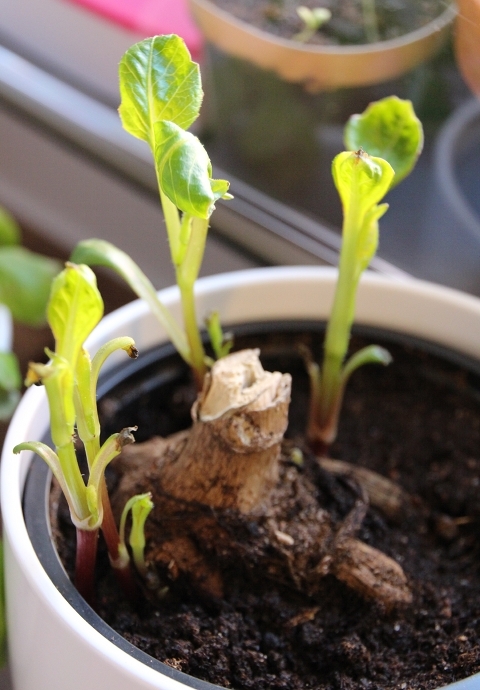 I also observed that the first shoots root better than successive shoots if you keep taking cuttings. Before taking cuttings I prepare the pots where the cuttings will root. I agree with Carol Klein that unglazed ceramic pots are better than plastic pots as they are better to retain moisture. Last year I used ceramic and plastic pots with clearly differing performance. As rooting medium I used a seed- and seedling compost from Kekkilä into which I mixed generously vermiculite. According to an article in BBC Gardeners World magazine in April 2011 dahlias root even better in sand but I have not tried this. If using sand, they probably need fertiliser earlier on as there aren’t many nutritients in the sand. Just before taking the cuttings I water and drain the pots. 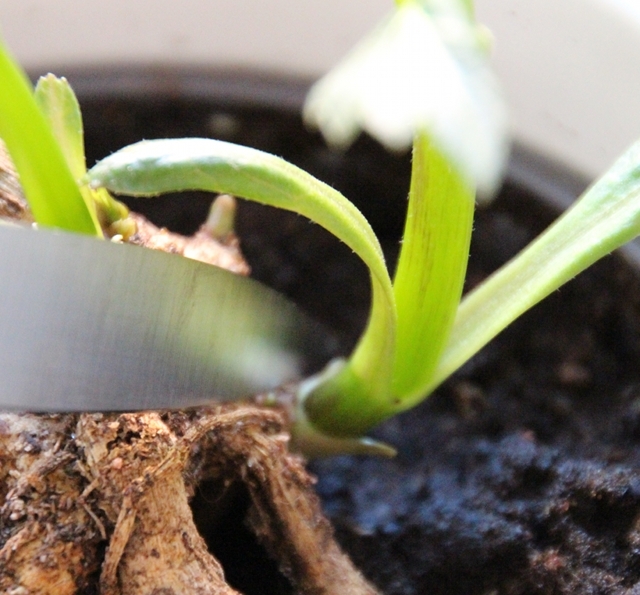 The cuttings I take with a thin, sharp and pointed kitchen knife (I found the curved blade of a grafting knife that I bought for the purpose particularly useless). I try to cut away with the shoot as much tuber as possible without damaging surrounding shoots or buds that I hope to turn in to cuttings later and I try to do one clean cut. I understand that cuttings require tuber tissue to develop roots, hence they are called basal cuttings. 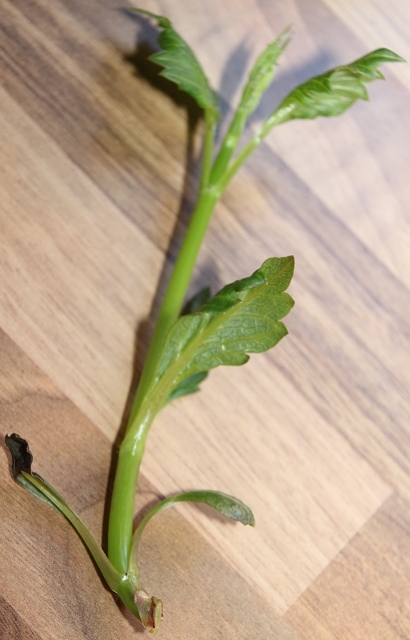 Once the cutting is removed from the tuber, I carefully cut away all leaves from the lower half of the stem. This part of the cutting will be in the compost and leaves would only start to rot in the compost. I do not remove the growing tip of the cutting. This will be done only once the cutting has rooted and started to grow again, in order to force the plant to branch out to grow multiple flowering stems. I also tidy any lose bits at the basal cut or the lower end of the cutting with the knife that could rot. I use the back end of a pen – or any other long object that is a bit bigger in diameter than the cuttings – to push a hole into the compost before I carefully ease in the cutting. This hole I push at least to the depth of half the cutting, better two thirds. Once the cutting is in the hole, I carefully push the compost around the cutting with my fingers to enclose the cutting with compost. I do not use rooting powder, which some literature recommends. I had good success rates all the same. Once I have all cuttings for the pot planted up like this I water and drain the pot. Watering ensures that compost encloses the cutting firmly and there is sufficient moisture. Draining is important as excess moisture would increase chances for the cutting to rot rather than root. 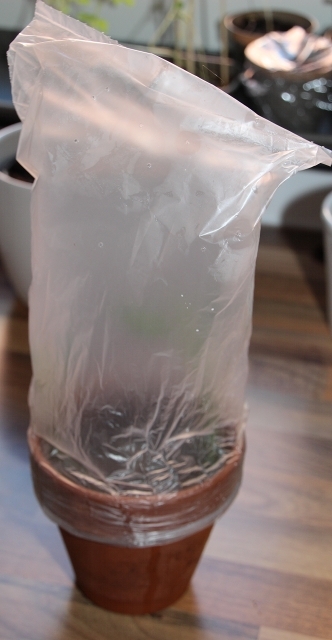 I place a transparent plastic bag with little airing holes in it on top of the pot or place the pot in a covered propagator, or both. This ensures that the air around the cuttings is moist and they do not dry out. As I am doing this inside whilst outside there is still strong frost, the humidity in my house is very low (I measured as low as 10%!) and without cover the compost and cuttings would dry out very quickly. I place the pot on a light but not sunny windowsill – and this year on my shiny new heat mat – and check moisture every day (and in the process I air the propagator/plastic bag preventing mould). Within two to three weeks first roots can be seen through the holes at the bottom of the pot. One should not take the compost out of the pot prematurely as this may disturb the rooting process and might even damage emerging roots (although I admit I have done this, which did not yield any information that I would not have learned from looking at the bottom of the pot). Once cuttings have properly rooted I repot them and start them on a diluted liquid fertiliser feed every other week. My dahlia dreams are coming true again, my first dahlias are awake! Last autumn I dug up all of my dahlias, sort-of freed them of earth, stacked them in plastic buckets and had them stored in my in-law’s garage (which is heated at 16C). I don’t have a suitable frost-free cold storage myself. With dark autumn days, christmas frenzy and winter taking the mind elsewhere, no one checked on those tubers, until I went in Mid-February to pick two dahlias from the buckets to take them home and wake them up. Although I have seen what dahlia tubers can look like on supermarket shelves after months of neglect and too warm storage, I felt my dahlias looked pretty grim and I was not sure they were still alive. I planted them up anyways – after shaking off dry earth and pruning excess roots – and watered sparingly, putting them on the kitchen window sill (getting very busy there already). For almost two weeks they looked dead. One root of one of the tubers even turned to mush when I touched it and I removed the rotten bit. In desperation I googled and found consolidation in the explanation that some dahlias wake up very quickly, others may need two months or more. A glimpse of spring and summer – a vigorous dahlia shoot! 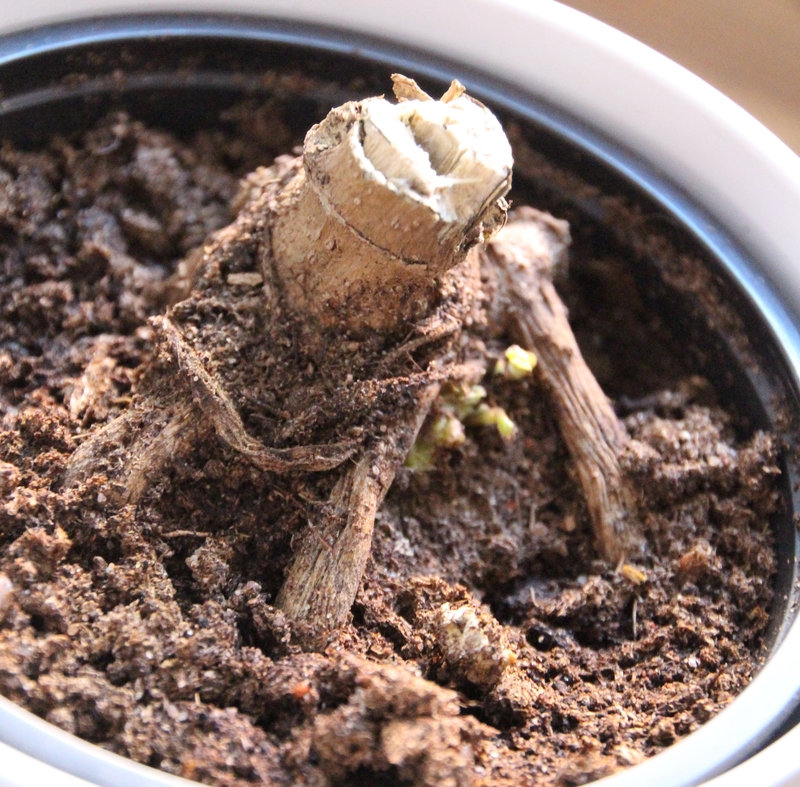 Shortly after, I was rewarded with one dahlia showing the first shoot, but for almost three weeks I was as good as convinced that the other dahlia would be dead. Now it is sprouting 8 shoots at once. 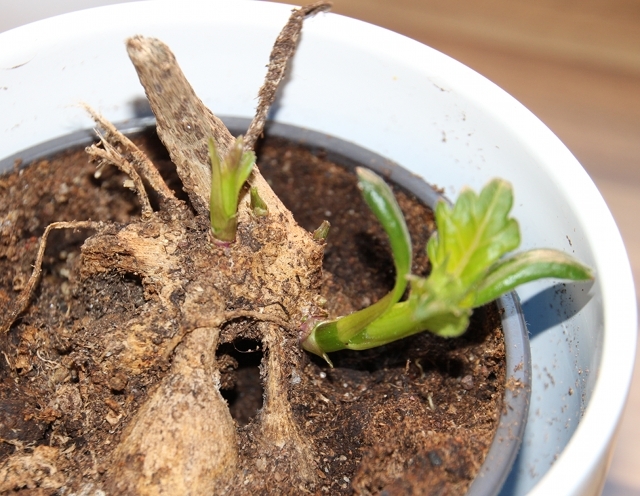 Both pots have roots peeking out at the bottom – since after the shoots appeared. Usual advise is to plant up dahlias in March/April. 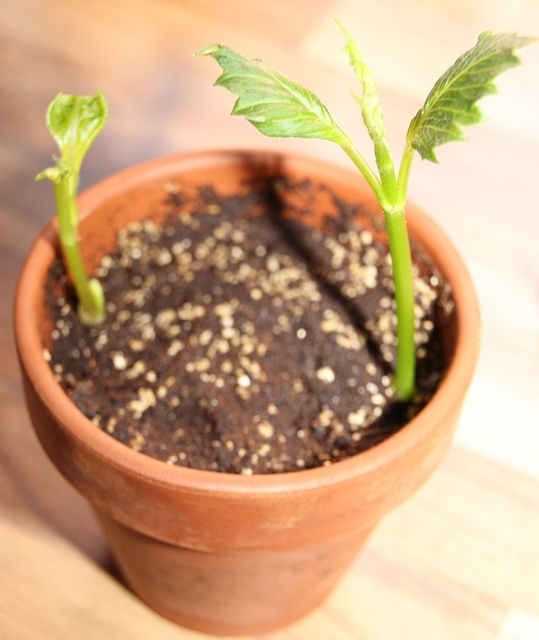 However, I planted those two dahlias already in February because I want to propagate them by taking basal cuttings. The dahlias in question, dahlia ‘Tamburo’ and dahlia ‘Sam Hopkins’ are those that I did not manage to propagate aplenty last year, because their later shoots were weak and rotted away rather than rooting. And while most of my dahlia cuttings last year rooted well, they started to flower only in Mid-August (I took the first cuttings 8th of April). 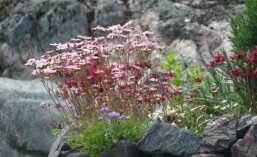 This year I want my cuttlings to start flowering in July. Therefore I started already in February.